Place ketchup into a small saucepan. Heat on medium heat, stirring constantly, until heated (not boiling). Carefully add 1/4 teaspoon baking soda, sauce will foam. Continue stirring until foam subsides and sauce looks like ketchup again. Reduce heat, add all other ingredients, stir until smooth and let simmer for 5-10 minutes. Heat a medium fry pan on medium high, add the oil and Bratwurst. Brown, about 2 minutes, turn over and brown for another 2 minutes. Turn heat to medium and cook until done. If using raw Bratwurst, about 10 more minutes. if pre boiled, about 5 more minutes. 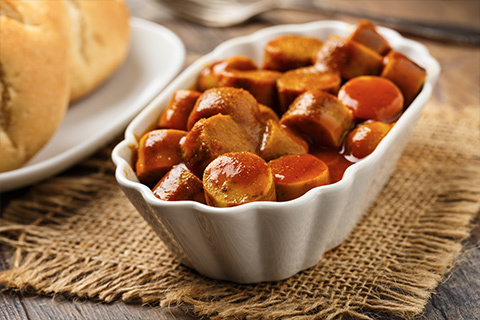 To serve, slice the Bratwurst, smother in curry sauce and sprinkle more curry powder over the top. Serve with a side of French Fries, sweet potato fries or slices of your favorite bread.